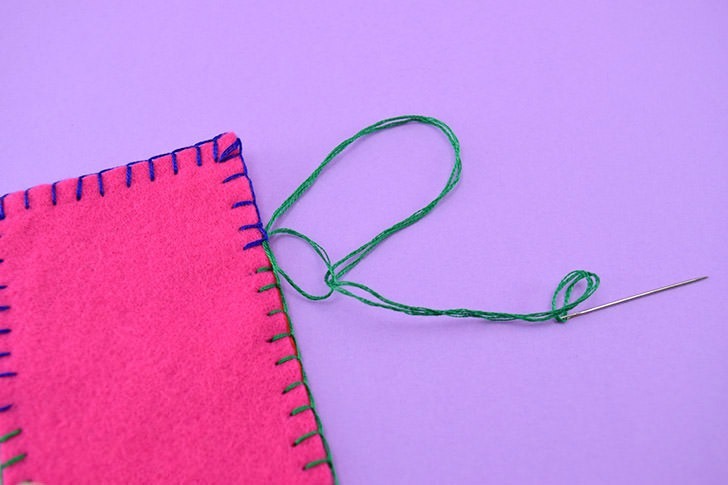 For the longest time when it came to the blanket stitch, I just sort of did whatever. And it turned out okay. It worked. I managed to blanket stitch around corners and change out my thread when I ran out and maybe it never looked the same twice but I was happy with the results. But here over the last few weeks, I’ve been doing the same project on repeat making a set of things for my grandmother and then my mom and now for myself. 12 things in total all exactly the same. Repetition is not normally my jam, but in this case, I was so happy with the first set that I just kept going with making the same thing again and again. In fact, I’m now making different things in the same style because it’s like this whole thing right now. Kind of like Jello. 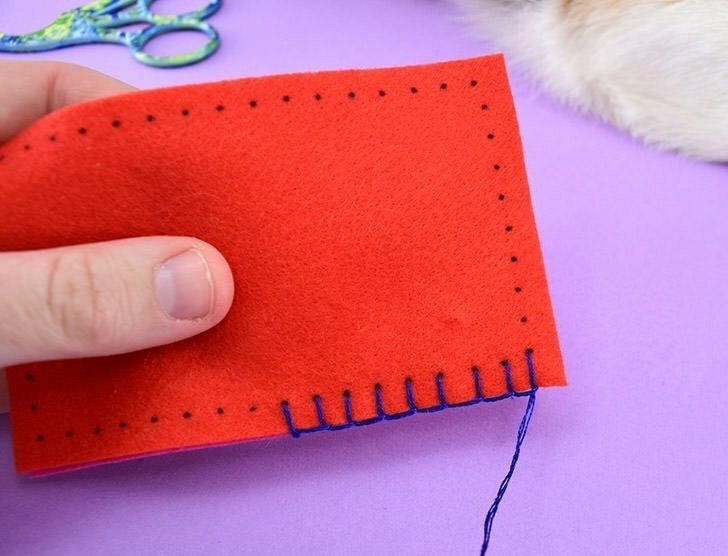 But back to the blanket stitch, the good news about the repetition on this project I’ve been working on is that I have really nailed down my favorite way to do the blanket stitch. And I do it the same way every time now with fabulous results that are always exactly the same. And since I’m a matchy-matchy kind of a gal, I’m pretty happy with this recent conquering of this stitch. The good news is that it isn’t hard and I can totally show you how to do it. 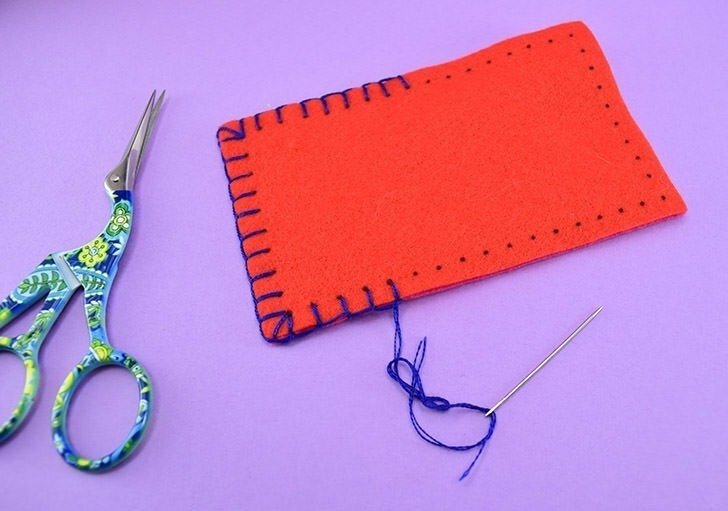 The following supplies are helpful when working the blanket stitch. 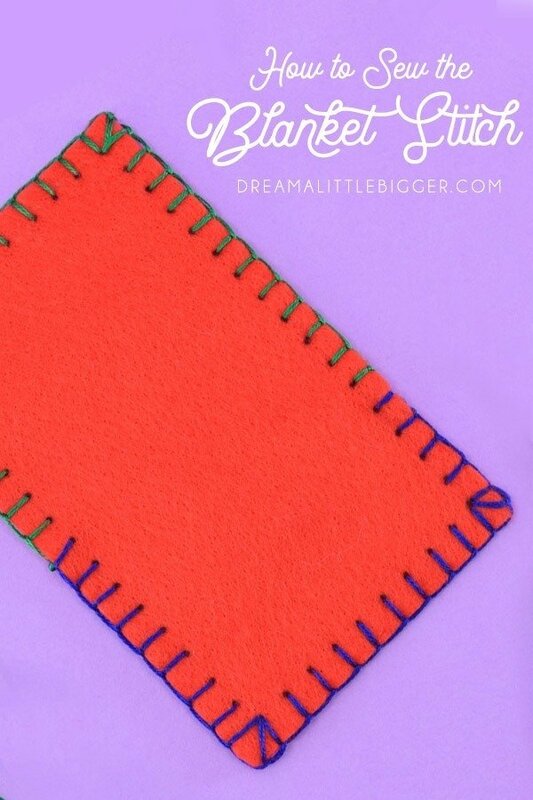 Learn how to sew the blanket stitch. 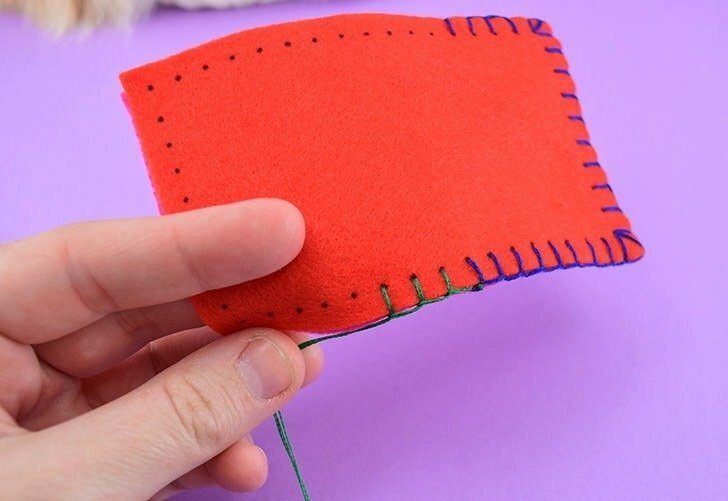 One of the most difficult parts of the blanket stitch, in my opinion, is getting the stitches equally placed as you create them around your project. 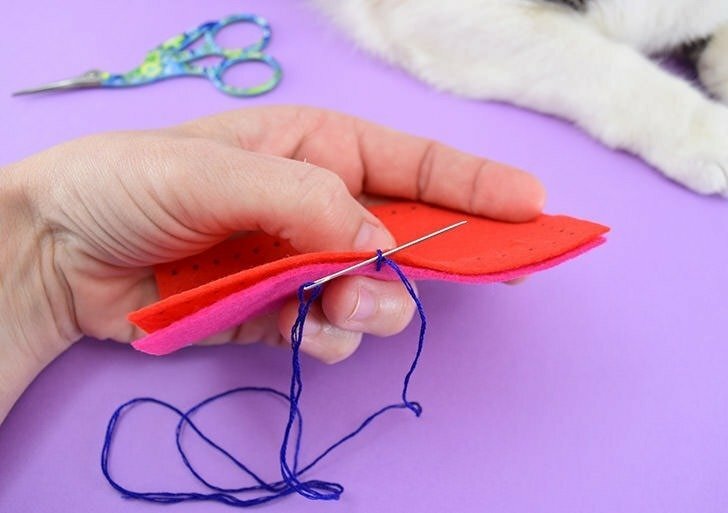 When things are a crazy shape, say you’re crocheting shut a felt toy that is the shape of an animal, measuring out the stitches so they’re as close to on point as you can isn’t really an option. 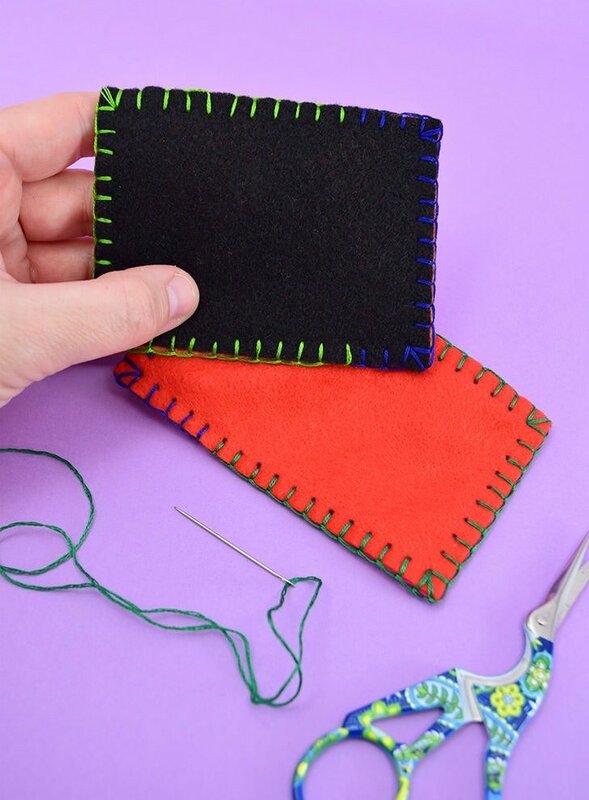 When your edges are straight, however, I think you really should measure out and mark the spacing for your stitches because along those straightaways mistakes can wind up being super noticeable. 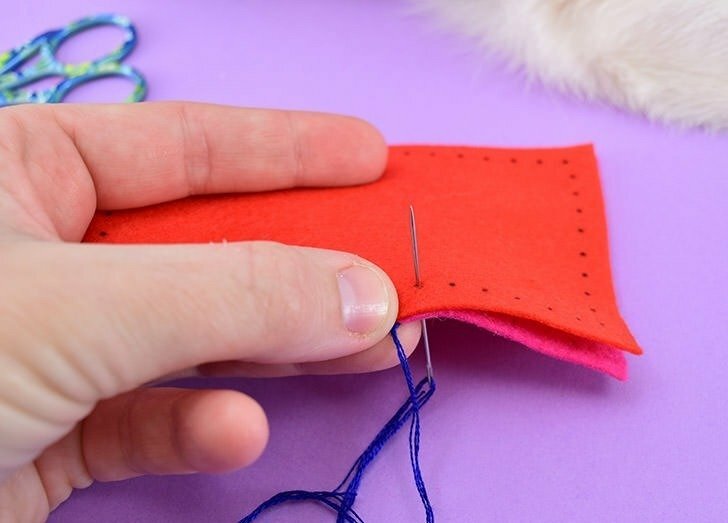 In this tutorial, we’re working with 2 pieces of felt. Since we’ve got 2 pieces we can hide knots and other ugliness between the pieces so they are not visible. 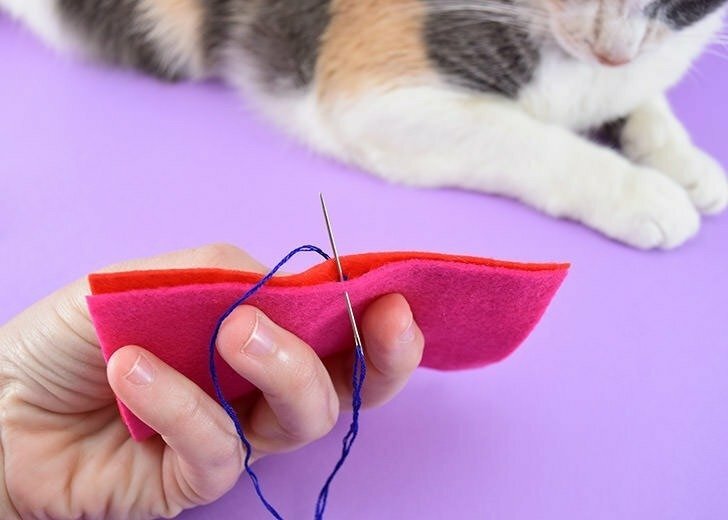 If you’re working with a single piece, say just adding a decorative edge to turn a piece of fabric into a blanket, you’re just going to have to do your best to make your knots not stand out too much. Sorry. Keeping them all on the same side is a great start but even better is folding your fabric over and pressing it down to create a nice, clean crease you can still hide knots away in. 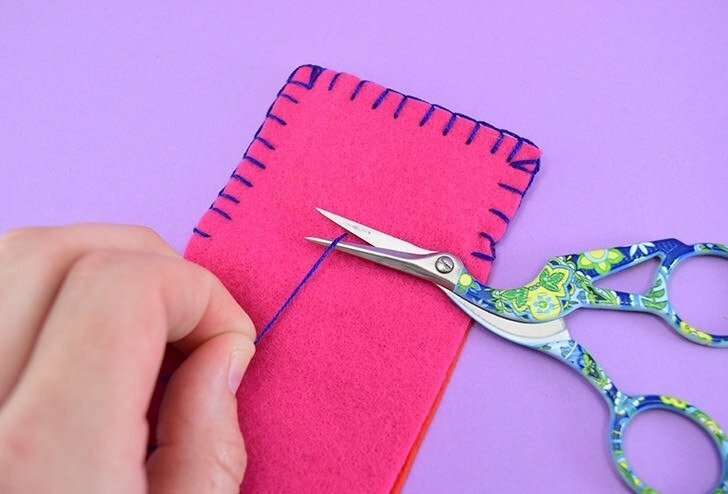 Using a clear straight edge and a water-soluble fabric marker measure out and dot where you want your stitches to occur. 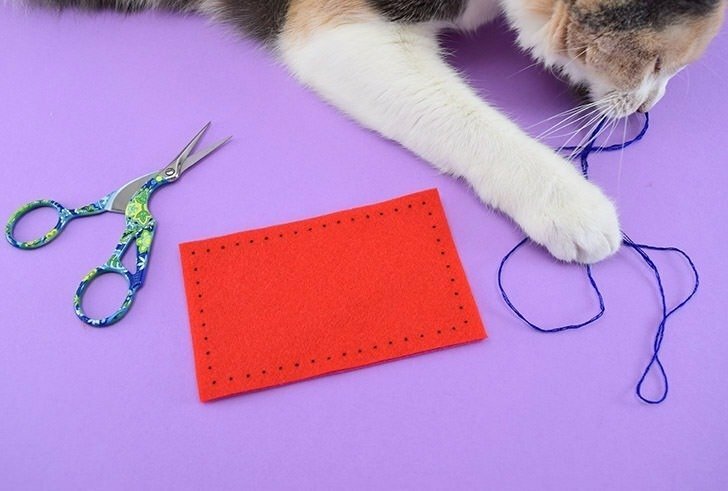 The size of your stitch will vary depending on how large your project is, but I tend to like a stitch right at 0.25″ when possible and I don’t much care for anything over 0.5″. Using a mat, like the one above from my Fiskars set with its grid and hash marks makes for super easy and really accurate marking for stitches. It also helps for measuring both for cutting pieces to size. I mean, see how awesome that rectangular shape is? AND there’s a pink piece that perfectly fits beneath it! Boom. 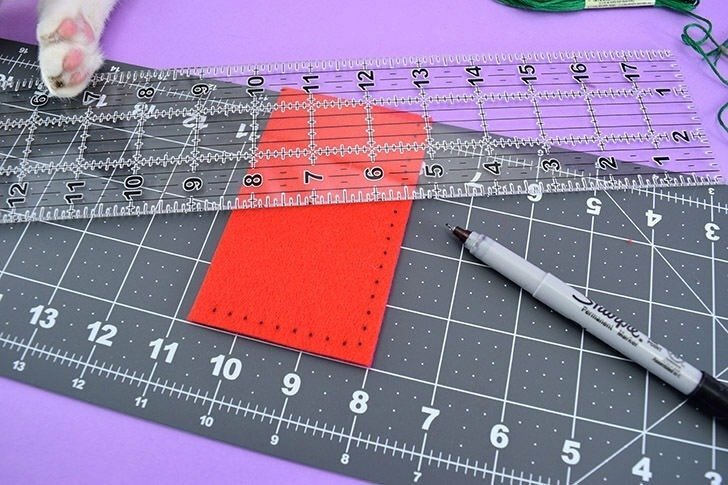 By the way, this 3″ x 18″ acrylic Fiskars ruler works perfectly with this rotary cutter and mat set if you’re looking to get the whole shebang. Once you’ve got your dots placed prepare your yarn or floss. 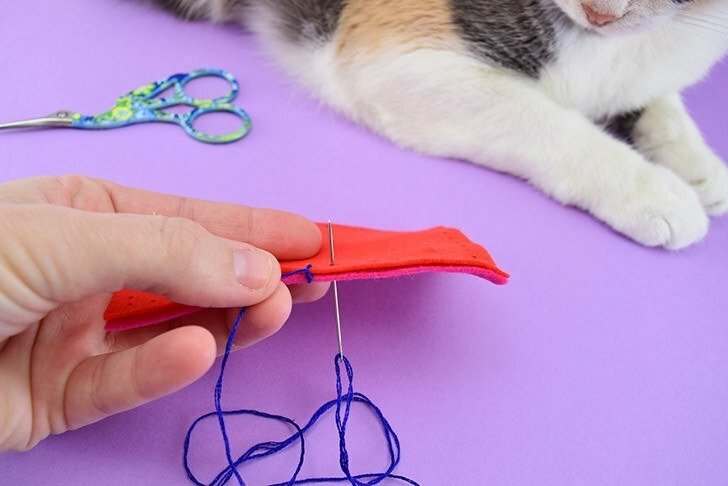 If using embroidery floss grab your favorite size embroidery needle and if using yarn grab a yarn darning needle. Now I don’t know tons about yarn needles so I purchase a darning needle set with multiple sizes and then run a test to see which works best with the yarn and fabric I’m using. When using embroidery floss I have found that I work best with 3 strands. It’s not so thick that it knots easily but it’s thick enough to be visibly seen. All of this is totally up to your preference and how well it works with your project at hand. p.s. Say hi to my cat, Maybe. She’s been an active cat craft assistant the last few weeks! Since I’m right handed I’m showing you, here, how to work from left to right. 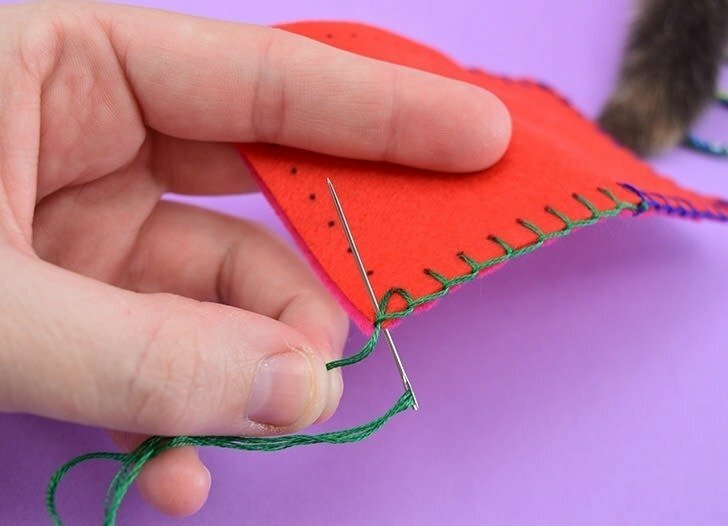 To start run your needle through the bottom of a stitch mark on the top piece of fabric only and run the thread through until the knot catches. Now run your needle through the same spot (or near as you can figure it without an accompanying mark) but only run the needle and yarn through that bottom piece. Pull the thread through until it is taut and forms your first stitch, but doesn’t pull so hard that it buckles the fabric beneath it. Run the needle beneath that stitch you just made along the edge where the two pieces of fabric meet and pull through. Now you’re ready to start the repetitive stitching down the line. 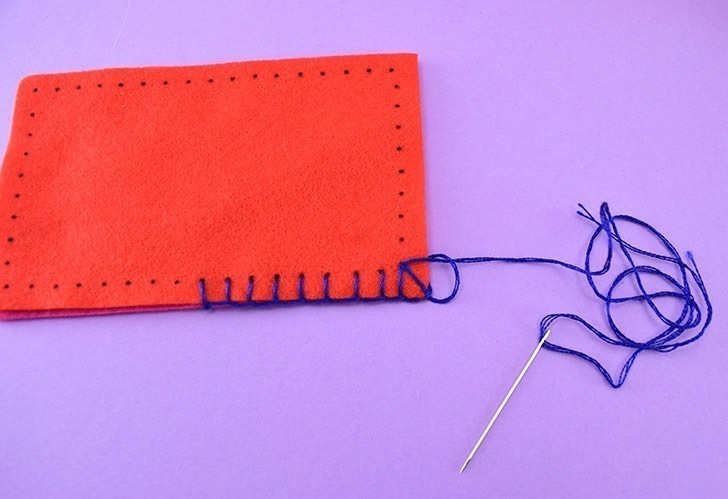 Run your needle from beneath both pieces of fabric through your mark for the next stitch. Going in the direction you are stitching toward wrap the thread, right as it’s coming away from your previous stitch, around the needle like you see above. 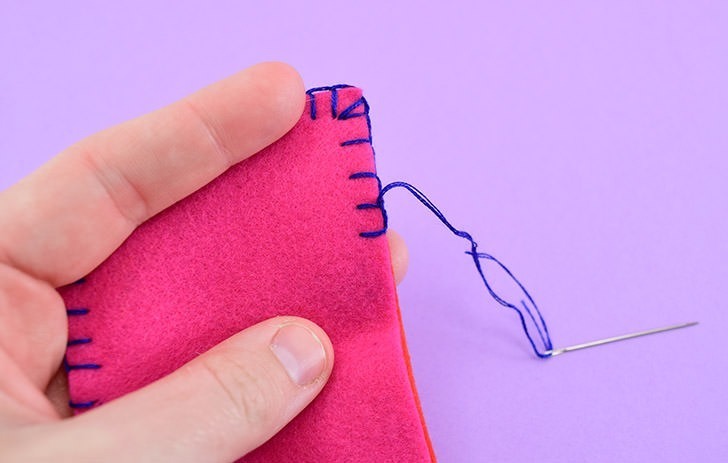 Pull the needle through and the thread will work its way around to form your blanket stitch. 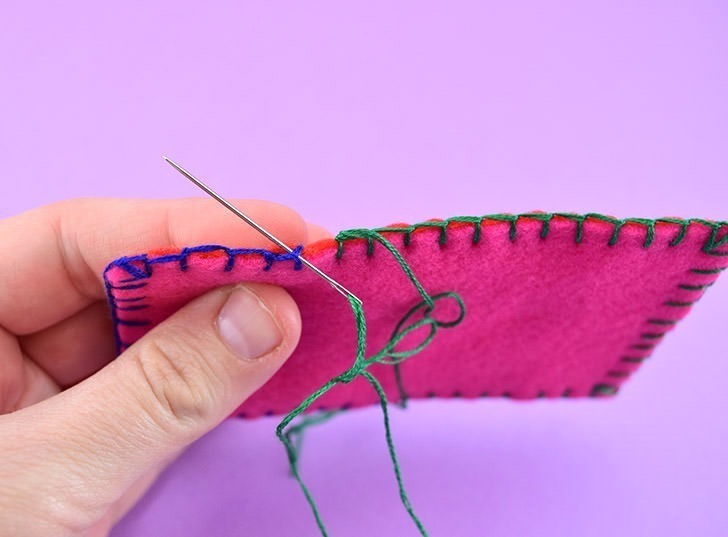 … wrapping the thread up over the needle (placing your thread in the same direction you are working toward) and pulling the needle through to finish the stitch. Continue down the line. But what happens when you reach a corner? 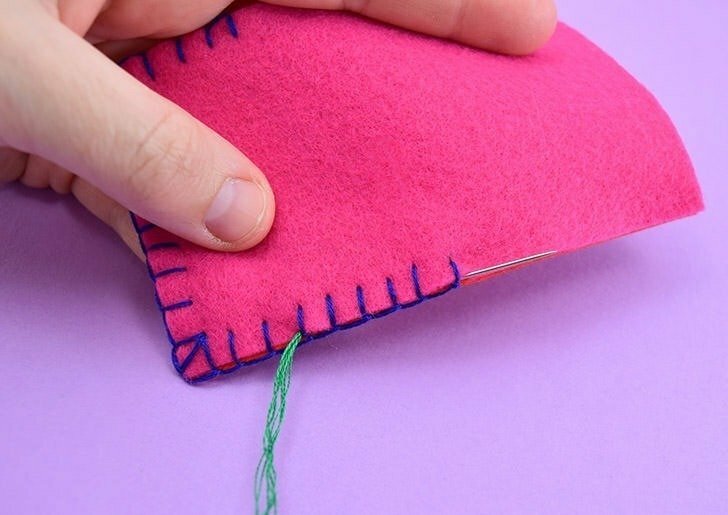 Learn how to blanket stitch around corners. 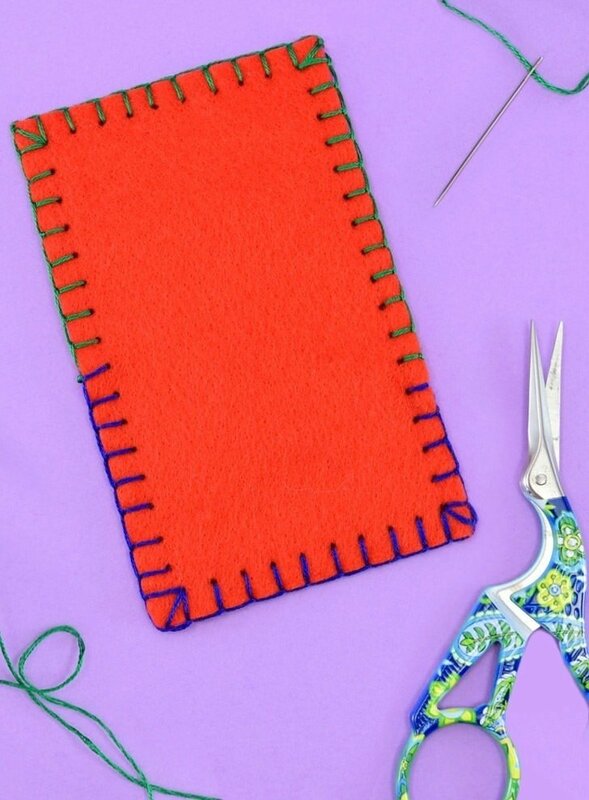 Make your stitch to the corner as you normally would. Next, you’re going to make 2 more stitches in this exact spot, one for the corner and one for the next side. 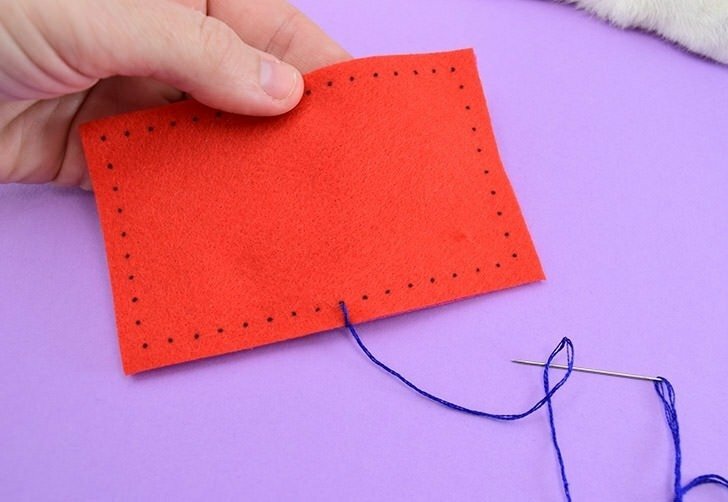 Run the needle up through the backside of both pieces of fabric in that same spot and then wrap the thread around the needle and pull through just like you did every stitch before. 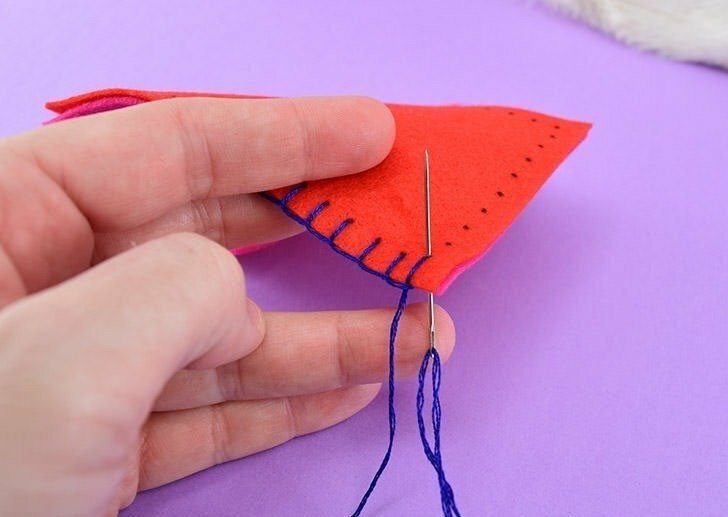 But as you pull the thread through this time, pull slowly and carefully keeping the thread at an angle that crosses over the corner of the fabric like above. 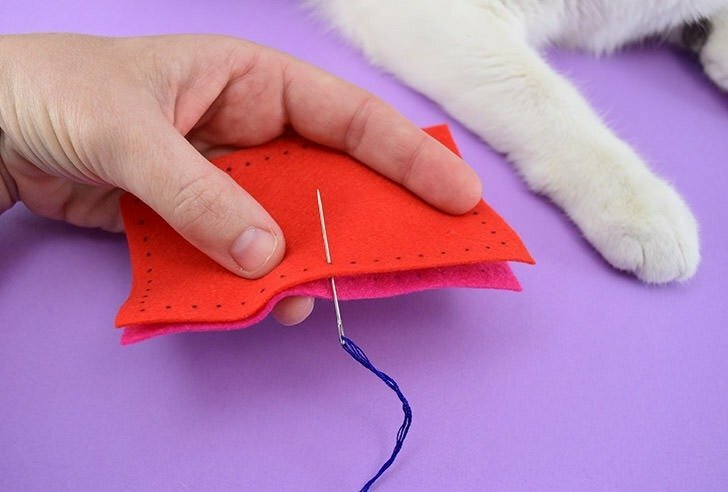 You literally need to direct the thread so that it stays in this position as you pull the needle through and the thread taut. See here, the corner thread is at that nice angle and the thread is neatly along the side of the fabric, but it’s not going to stay in place on its own. 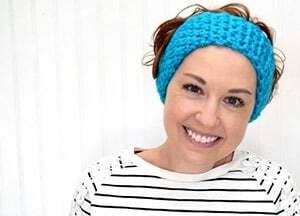 Create your third stitch, along the next side of the piece in the same spot as your prior 2 stitches. Turn your piece and continue to work around. 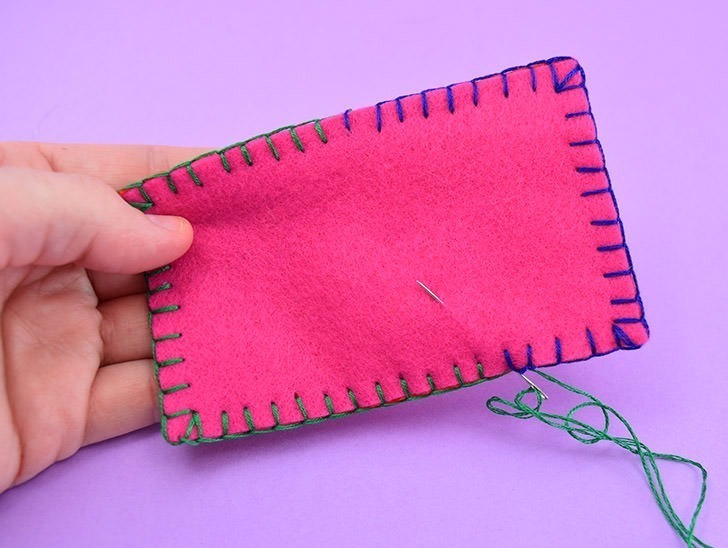 Learn how to change thread during the blanket stitch. 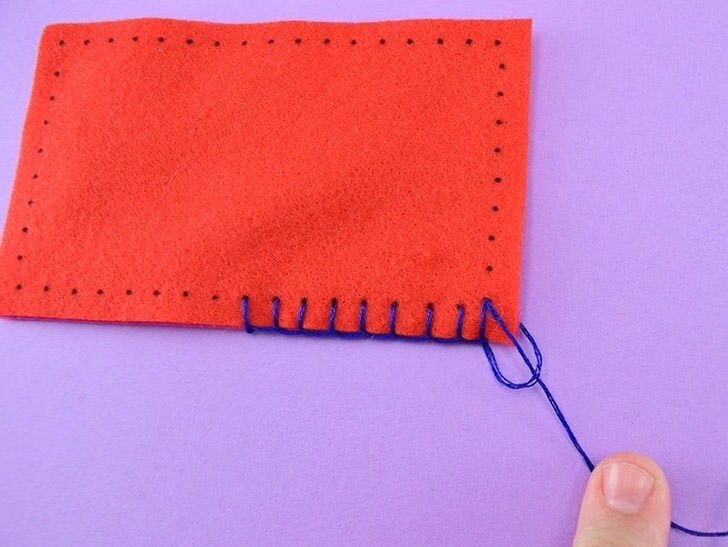 You’ll need to start by tying off your first piece of thread. 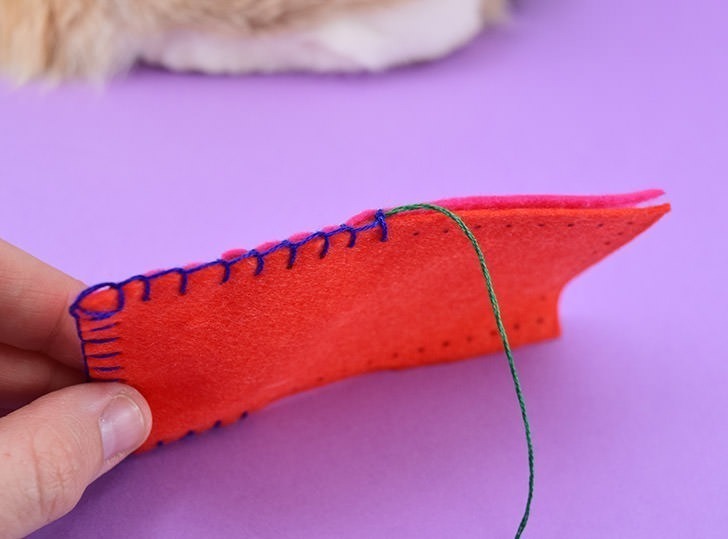 This is also how you end your blanket stitch if you’re done, by the way… Wrap your needle around the join of your most recent stitch once and then run it around the next nearest stitch once. In the pic above, the needle is running around that second stitch. Create a small overhand knot twice right along that second stitch. Push the needle up through the two pieces to somewhere in the middle, making sure the thread isn’t visible on either side of the fabric as you go. 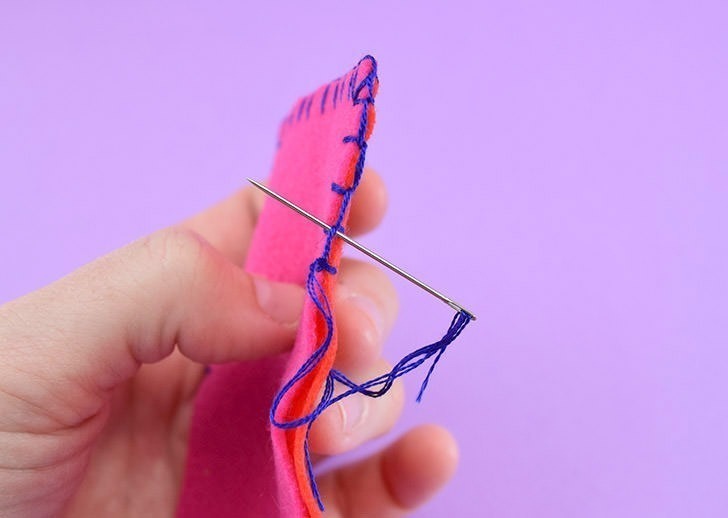 Pull the needle through and the thread slightly taut (see how along the side the stitch with the knot is buckling inward a bit) and snip the thread. 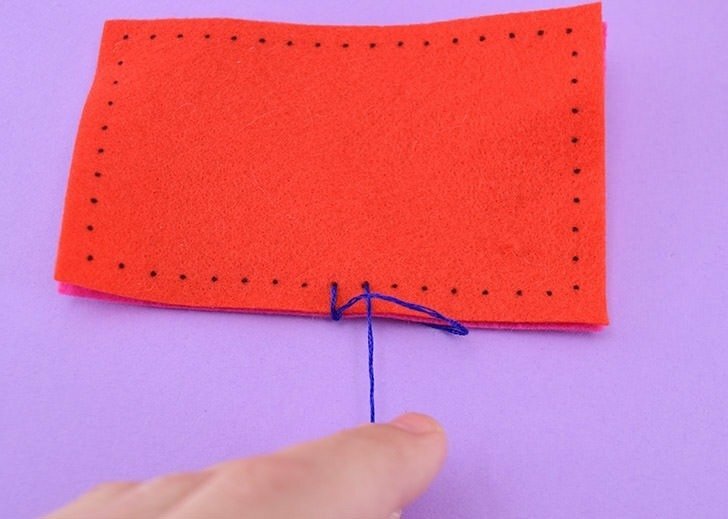 Once cut the string will loosen up and shrink in behind the the 2 pieces of fabric, no longer visible. 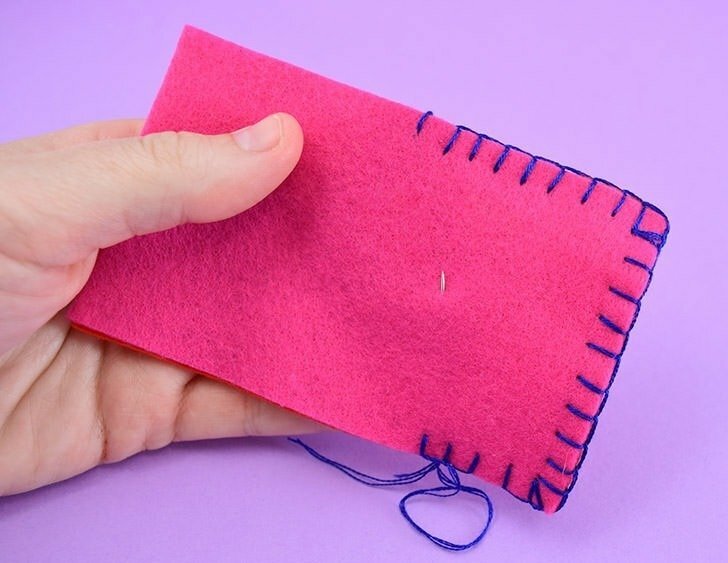 Once you get to that most recent stitch, run the needle and thread around it in between the two pieces of fabric just like you did in the beginning. Yep, that’s how you do it. 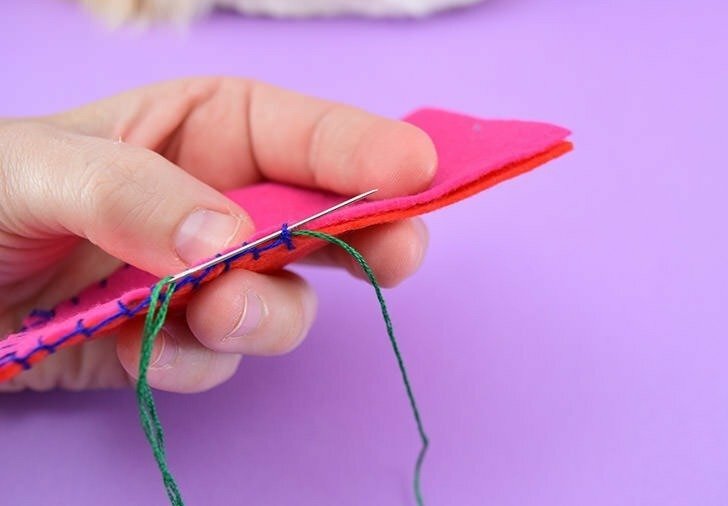 Pull the thread through until it gently catches and your new piece of thread is ready to keep rocking out the blanket stitch! 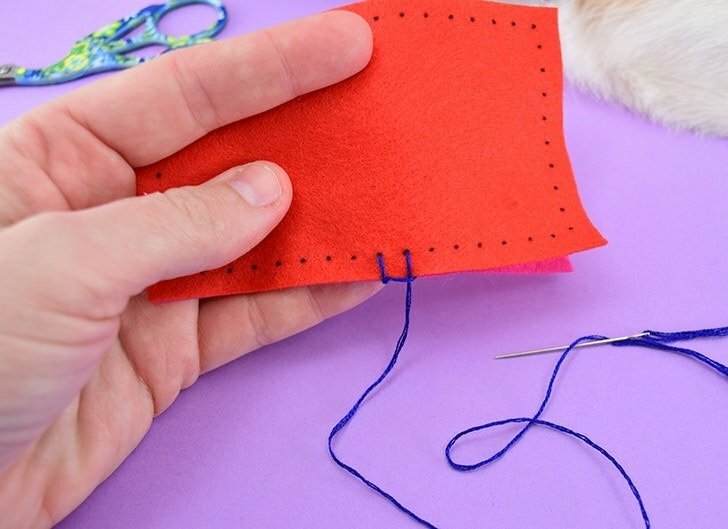 How do you work the blanket stitch left-handed? And now we’re going to kind of show you how it would work if you were left-handed. Alas, I’m still right handed but I’m going to try :) Basically you’re doing the exact same thing that we did as right-handers. 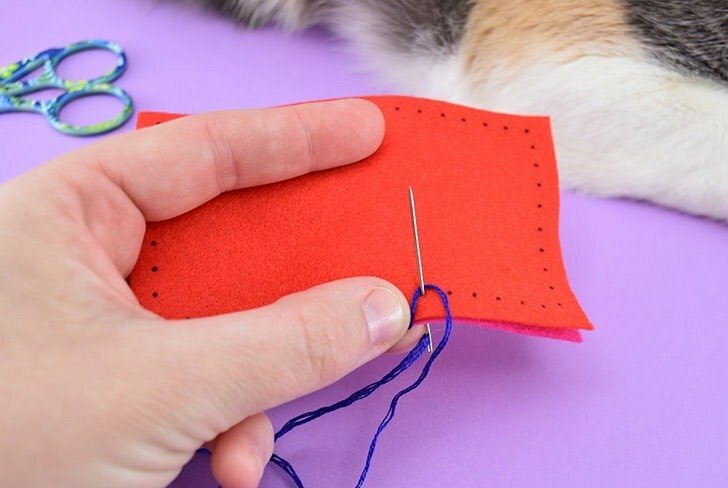 Run the thread through the bottom of the fabric in the marked stitch and then wrap the thread, as it is nearest the most recent stitch up over the needle in the direction you’re working toward stitching. 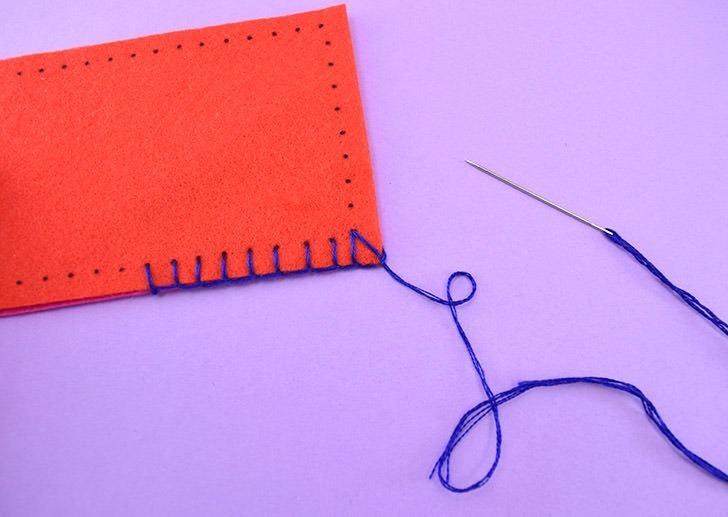 As you work right to left, use your right hand to hold the previous stitches in place as you continue forward. Unfortunately, I couldn’t figure out how to make my hand do that so I worked to keep business taut with my left so I could continue stitching with my dominant hand, but, again, the technique is just the same, only reversed. 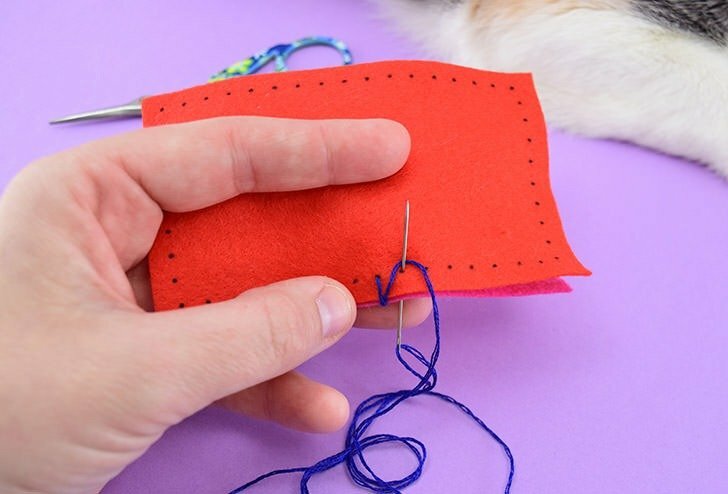 The most important thing to remember, whether working a right-handed or left-handed blanket stitch, is to run the thread over the top of the needle in the direction that you’re stitching toward. 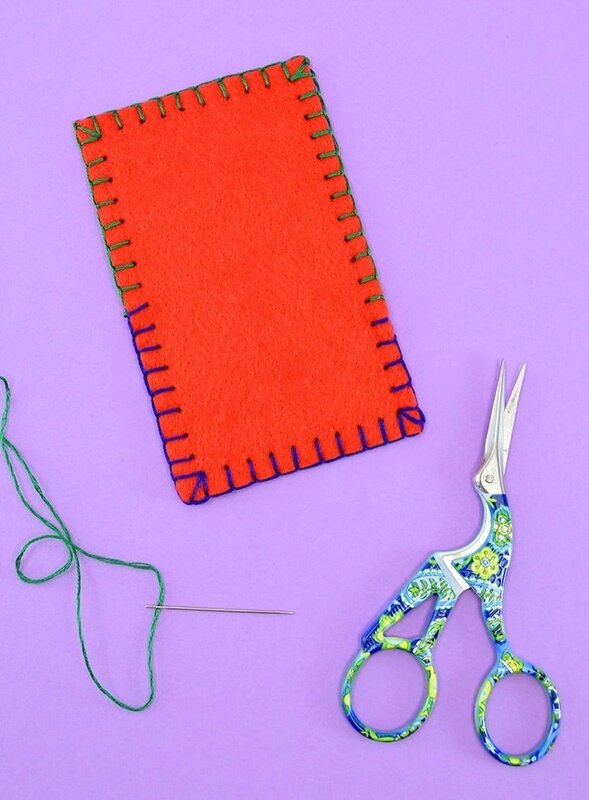 Continue your stitches, whichever direction you’re working until you’re ready to finish it off. But how do you finish it? 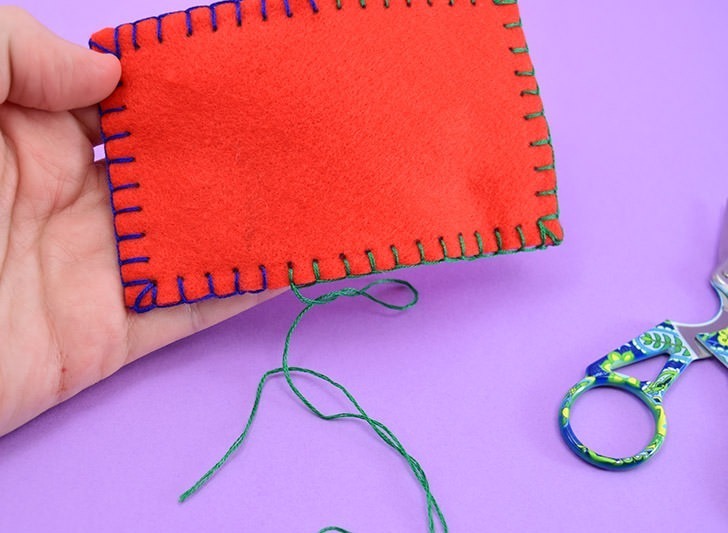 Learn how to finish the blanket stitch. Run your needle beneath the first stitch you made like seen above. Make a tiny overhand knot twice right there to tie off the thread. 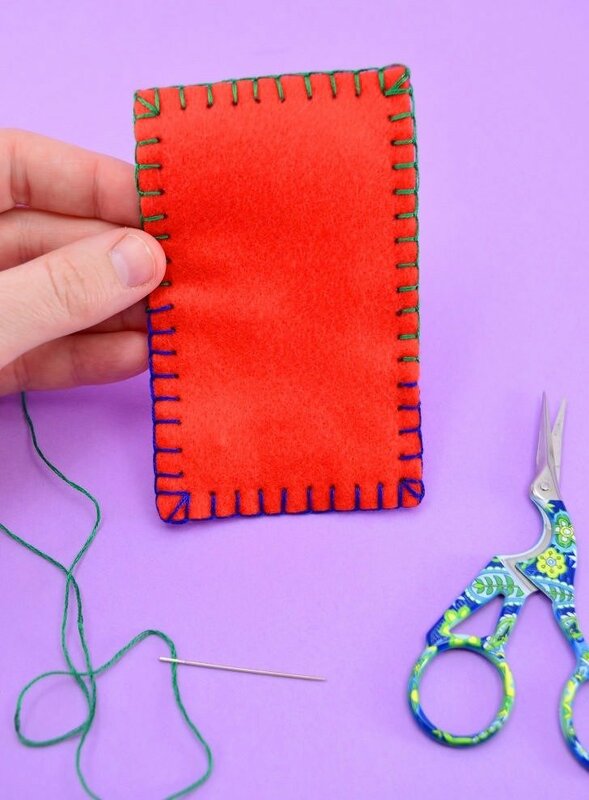 Run your needle up through both pieces of fabric to somewhere in the middle, pull the thread taut and trim it. It will again loosen back up to hide in between the 2 pieces of fabric. 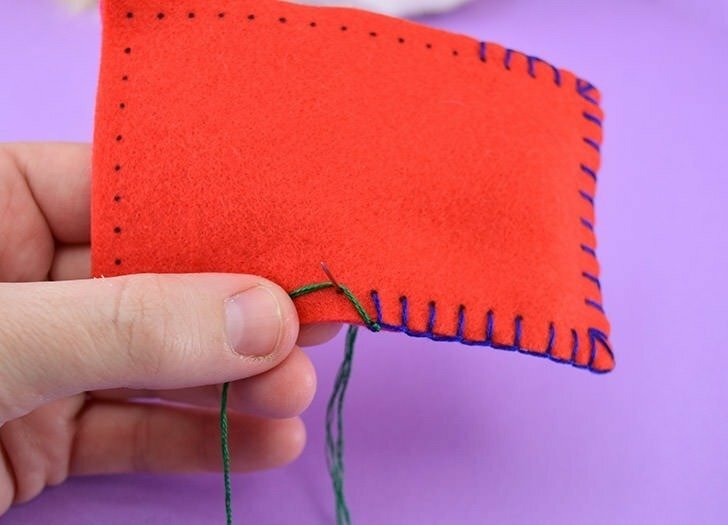 The blanket stitch is a great and easy way to bind 2 pieces of fabric together cleanly and prettily and it’s not too difficult to do. When utilizing thread or yarn in a contrasting color, the resulting look can even be very striking. And I’m pretty sure that this is everything I can think of to share about this stitch and how to do it but if you have any ideas to share to make it easier for all of us, or any questions that weren’t addressed, please feel free to leave suggestions or inquiries in the comments and I’ll do my best to see about adding the information as needed to this post in the future!